The majority of infections that appears on the mouth and face region are odontogenic or arising in tissues that give origin to the teeth. Of these, approximately 70% present as inflammation around the roots of teeth, principally acute abscess that involves the tooth and bone. Odontogenic infections can be life threatening within a short span of time. All odontogenic infections are polymicrobial in nature. These microorganisms cause a variety of diseases such as cavities and gum disease. When they gain access to deeper underlying tissues through a dead pulp or though gum pockets, they cause odontogenic infections. 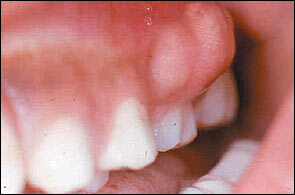 Odontogenic infections progress through three stages: inoculation, cellulitis and abscess. Origin of these infections can be periapical (as a result from pulp death due to tooth decay, which is the most common) or periodontal (as a result of deep gum pocketing). Once the infection has eroded bone it spreads to soft tissues in which the path of spread is determined by position of perforation relative to muscle attachments. 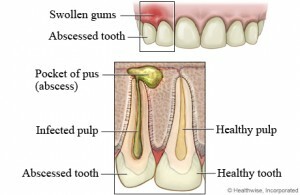 How does a tooth abscess develop? 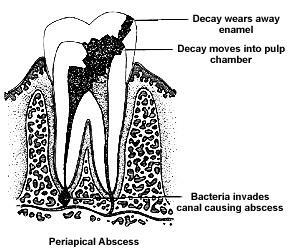 An acute periapical abscess may develop either directly from acute periapical periodontitis (inflammation of the tooth supporting tissues around the apex) or usually from a chronic periapical granuloma. These conditions are caused by pulpitis and pulp death from cavities or recurrent secondary cavities after a filling is done, trauma to the tooth or even endodontic treatment. If the cause of the dental abscess is not removed, for example by extraction of the tooth, root canal treatment, or antibiotic therapy, pus discharge will continue and the abscess continues to enlarge. The increase in hydrostatic pressure within the abscess associated with progressive pus discharge causes the pus to track in one of a number of directions. It may drain through the root canal if this is open to the mouth or occasionally it may track through the periodontal ligament (the ro0t supporting tissues) to discharge into the gum sulcus. More commonly, the pus tends to track though the cancellous bone of the jaw and eventually perforates the cortex or the outer layer of the jaw bone. Most abscesses point towards the cheek as the root apices is closer to the buccal (cheek) than to the lingual (tongue) or palatal (palate) cortical bone plates. However, abscesses related to the apices of the upper teeth, particularly lateral incisors and the palatal roots of molars and premolars, often track towards and point on the palate. Once the cortical plate (or outer layer of bone) is perforated the pus strips up the periosteum (the dense membrane covering the surface of bone) and may result in the formation of subperiosteal abscess. More frequently, it penetrates the periosteum after which it may track in various directions. Although the apices of the roots of the lower second and third molars lie close to the lingual cortical plate, the bone in this area is very dense and is rarely penetrated. After the pus has perforated the cortical plate its subsequent routs of spread are dictated largely by anatomical factors. The relationship of the cortical perforation (which itself is related to the position of the apex of the abscessed root) to the origins of muscles and the strength of the overlying periosteum are important factors. The pus may discharge directly into the mouth through a sinus following local penetration of the overlying periosteum and mucosa. This may occur with little or no pain and only a small swelling may develop on the soft tissues of the mouth before the pus breaks though. On other occasions the pus may accumulate beneath the mucosa and the individual may complain of a ‘gumboil’ before a sinus develops. A nodule of granulation tissue often forms in response to the irritation by pus and marks the opening of the sinus. The dense palatal mucoperiosteum is resistant to penetration by pus. Pus tracking palatally may spread under the mucoperiosteum towards the back of the mouth to the junction of the hard and soft palate and present as an abscess on the palate. Abscesses related to upper front teeth may perforate the labial (lip) bone above the attachment of the levator anguli otis muscle. The infection may then pass medially and upwards towards the inner canthus of the eye, obliterating the nasolabial fold (the crease above the angles of the mouth) and into the loose connective tissue of the lower eyelid. Alternatively the infection may pass into the upper lip. Abscesses developing at the root apices of upper molars and premolars are very close to the floor of the maxillary sinus and consequently may discharge into the sinus.